There are many benefits to choosing cost-effective surface refinishing over replacement. You’ll save up to 75% on the cost, the project will only take as little as two days or less, and you’ll have a beautiful, durable surface that looks like new. Homeowners throughout Rochester, NY, count on Miracle Method of Rochester when their counters are damaged, bathtubs are chipping, and tile floors are scratched. Turn to Miracle Method of Rochester for honest and reliable service. We have convenient appointments available Monday – Friday, 8am – 5pm, and we’re ready to handle all of your surface refinishing projects. Give us a call or visit our showroom on Ling Road in Rochester. 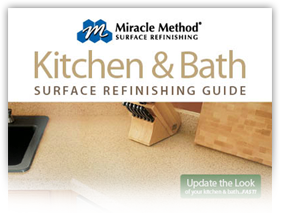 Make your tubs and countertops new again with Miracle Method of Rochester, NY. Do you have ugly bathtub syndrome? Are your countertops screaming for some refinishing? Let the detail oriented and highly skilled technicians at Miracle Method of Rochester, NY come and save the day! Are you tired of seeing your pink, olive green, or powder blue bath tub? Have you dreamed of refinishing or replacing your chipped countertop, but want an affordable refinishing alternative? Miracle Method of Rochester, NY is there for you! We have a process that is very unique from other refinishing companies. We even refinish tile floors in commercial settings! Hundreds of apartment complexes, schools, and hotels around the country have enjoyed the benefits of our amazing refinishing technology. We have massive confidence in our product. Confidence so enormous that we offer a five year warranty! Call upon a company that has so much confidence in their product that they offer a five year warranty? We invite you to try to find another company who will do give you that warranty. We have become Rochester, New York's most preferred refinisher because of our high level of customer satisfaction, superior products, and amazing reputation. Read about us in the Rochester Business Journal.